Based on their math, my calculations are that 10 days in God’s presence must be better than 10,000 days anywhere else. Jesus, God present in the flesh, multiplied time in a similar way in His earthly life. John's gospel says, "the whole world would not contain the books" if every story about him were told. There's a lot that happens when Jesus is present. One day seems like a thousand and we can only tell a few of the stories. 10 Days is a corporate journey. This year, it involved believers in more than 25 cities coming together to worship, pray, repent, humble themselves, and meet with God. It’s also a highly personal journey, especially for those who set-apart the days to meet with God in fasting, prayer, and repentance. In this report, we'll give brief snap-shots of five of those cities, linking to some more detailed accounts. Over the next weeks we’ll be sharing stories from even more cities and also some more personal takes on what 10 Days has meant. I spent the first half of 10 Days in Wilmington. It was a taste of heaven on earth! I would highly recommend reading Mike Thorton’s full recap of the gathering. Highly recommend! And there’s lots of pictures too! 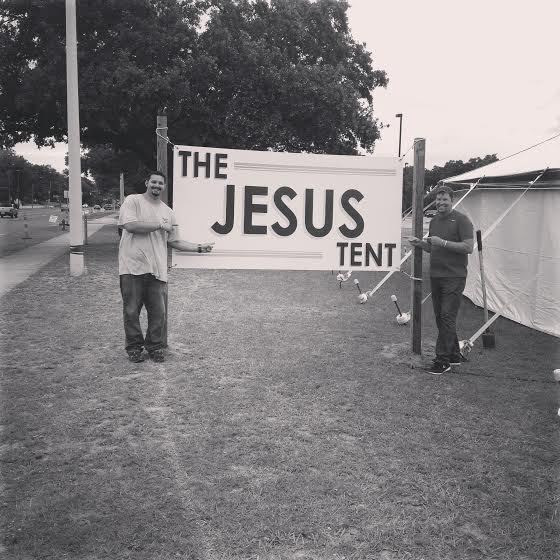 The Wilmington gathering took place in a tent on one of the main streets in Wilmington, outside of Legion stadium. 24-7 worship was the heart of the tent, fueled by local and visiting worship leaders. God was tangibly present and many people were drawn by that presence from outside into life-changing encounters with Jesus. 1,500 pounds of fish are fried to feed 3,000 at the tent…for free! The homeless broke into the communal restroom supply cabinet just as the town had feared. But instead of trashing it, they cleaned the whole restroom from top to bottom! Most 10 Day gatherings have moved from location to location. There was something very powerful about being in one place and in public. I believe that the Wilmington gathering is something that’s going to inspire other cities and change the expression of 10 Days for years to come. This was the third year 10 Days was hosted in Hollywood. Karen Covell and Melissa Haskin did an amazing job organizing 18 different gatherings over the 10 Days. They had a special focus on praying for the arts and artists in Hollywood. I love the way that God moves and inspires each 10 Days gathering in a distinct and unique way. Denver took a fascinating but very appropriate approach to the fall 10 Days this year. They saw it as an opportunity to give preference in honor to Messianic congregations in the Denver area. Messianic congregations were invited to host and teach and the entire 10 Days had a distinctly Jewish flavor. The link above has a day-by-day summary. Here are just a few highlights below. “This fall the 10 Days of Awe was observed by Denver churches and ministries, hosted primarily by our Messianic brethren. Rabbi Stew Lieberman and Rabbi Michael Walker of Church in the City / Beth Abraham hosted our Sunday evening kickoff service for Rosh Hashanah, the feast of trumpets. About 300 were in attendance as we came together in worship and prayer for Israel and for our nation and state…. God has been doing an amazing work within traditionally Protestant churches over the last 50 years, breaking down walls between congregations and denominations. However, there are still significant barriers both culturally and theologically between Protestant, Catholic, and Eastern Orthodox followers of Jesus. Kelly Steinhaus has been very intentionally pursuing bringing those walls down in Boston. This year half of 10 Days Boston was hosted by Catholic and Orthodox Christians. This fact alone is worth celebrating! It’s something that was literally impossible as recently as 2012. Please see the Unite Boston Blog for some great video testimonies from 10 Days. When Jesus is around, He does more amazing things than books can hold. These are just a few of the stories from five cities that gathered together during 10 Days this year. It’s my prayer that you are grateful, encouraged, and inspired by what God is doing! Thank you Jesus!!! We’ll be sharing more good news in the days to come.